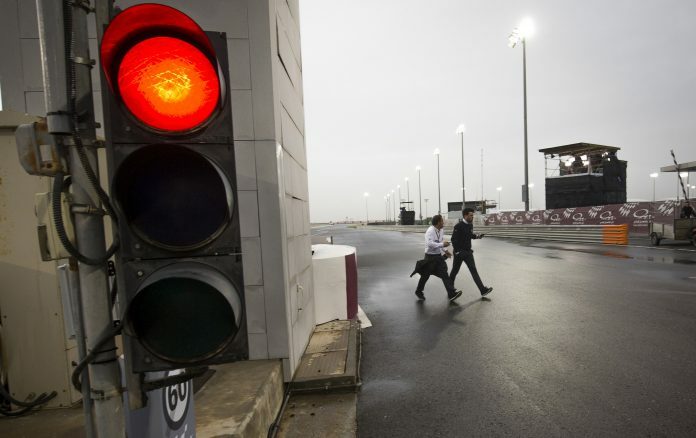 After overnight rain, a storm and too much standing water on track at Losail International Circuit, the original timetable for Saturday at the #QatarGP saw some adjustments before the decision was taken by Race Direction to cancel track action for the day. Conditions were deemed too dangerous to enable riders to get out on track – with little chance of improvement as rain and lightning began again. Therefore, it’s combined times after the end of FP3 that will decide the grid ahead of Sunday’s racing. That means Maverick Viñales (Movistar Yamaha MotoGP) will start from his first pole for Yamaha, with Team Suzuki Ecstar’s Andrea Iannone and reigning Champion Marc Marquez (Repsol Honda Team) joining him on the front row. 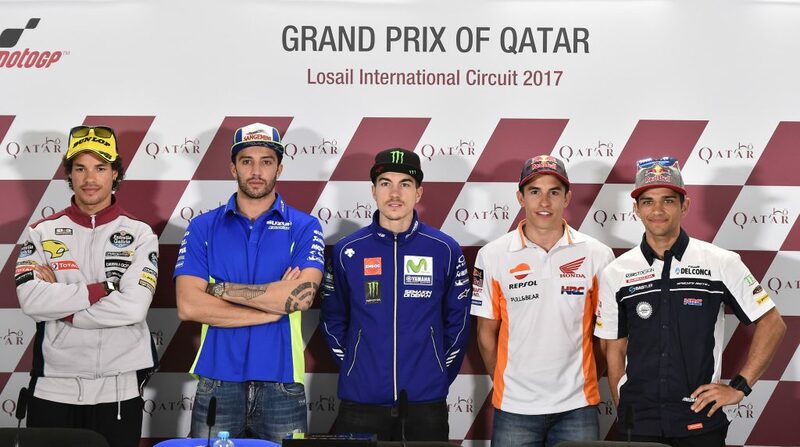 The second row is: top rookie Johann Zarco (Monster Yamaha Tech 3), Andrea Dovizioso (Ducati Team) and Scott Redding (Octo Pramac Racing) in sixth. Nine-time World Champion Valentino Rossi (Movistar Yamaha MotoGP) heads up Row 4 in tenth, ahead of Danilo Petrucci (Octo Pramac Racing). Jorge Lorenzo is in 12th on his debut with the Ducati Team. Warm Up will be extended tomorrow for MotoGP™, Moto2™ and Moto3™, with each session given a new length of 30 minutes. Franco Morbidelli (EG 0,0 Marc VDS) will start from pole in Moto2™, ahead of teammate Alex Marquez. Tom Lüthi (CarXpert Interwetten) is in P3. Dominique Aegerter (Kiefer Racing), Xavi Vierge (Tech 3 Racing), and rookies Francesco Bagnaia (Sky Racing Team VR46) and Fabio Quartararo (Pons HP40) complete the top ten. Jorge Martin (Del Conca Gresini Moto3) starts from pole ahead of Philipp Oettl (Südmetall Schedl GP Racing) and Romano Fenati (Marinelli Rivacold Snipers). Bo Bendsneyder (Red Bull KTM Ajo) and teammate Niccolo Antonelli head Row 2, joined by Joan Mir (Leopard Racing) in P6. Andrea Migno (Sky Racing Team VR46), Aron Canet (Estrella Galicia 0,0), Juanfran Guevara (RBA BOE Racing Team) and Marcos Ramirez (Platinum Bay Real Estate) complete the top ten.